Nancie McDermott, widely regarded as the American expert on Thai cooking, offers a clear, straightforward approach to dishes that many Westerners have tasted only in restaurants. 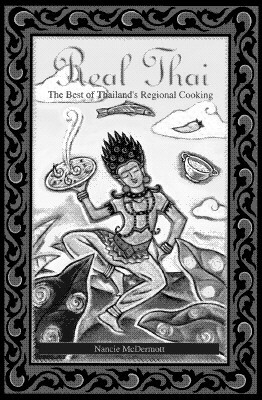 In "Real Thai, " she demystifies once and for all every aspect of this flavorful, healthy cuisine. Organized geographically by region, over 100 tempting, easy-to-follow recipes explore not only dishes that may be familiar to Americans, such as Chicken Coconut Soup and Pork Satay, but also lesser-known local specialties such as Crab Cakes with Cilantro Paste, Fish with Yellow Curry Steamed in Banana Leaves, Sticky Rice with Mangoes, and Son-in-Law Eggs. Including advice on basic utensils and techniques, a glossary of ingredients, a list of shopping sources, and a section of suggested menus, this is the definitive guide for novice and expert alike to the diverse flavors of a regional Asian cuisine that is rapidly becoming an international favorite.